Throughout the world, crowded taverns thrill to a “shout for stout.” US beer drinkers might think that odd, but only until they learn the meaning. In a vast number of Anglo-oriented pubs customers recognize “a shout” as slang for a declaration to buy the next round. Not surprising, the grateful response usually results in a flurry of orders for stout. Stout? Indeed. They could have used words like strong, full, big or impressive, but in their vernacular they described extra strength beers as stout. The search for why the acidic, bitter-coffee nature of stout gained popularity over the rich, chocolate taste of porter has little connection to beer. In stout’s case it leads to the insurance business. That strange form of making money started when businessmen began underwriting the safe voyages of ships. They took a chance by guaranteeing a payoff when a ship encountered tragedy; in exchange for this promise they reaped a tidy profit if the cruise was successful. Obviously the key to making money hinged upon the underwriter’s ability to assess accurately the risk inherent in any particular ship. To ensure they had an edge, many underwriters stayed close to the piers. Entrepreneurs saw this steady pier side activity and responded by providing a place where the insurance agents could sit and conduct business while enjoying refreshment. What they provided was the origin of the coffee shop. Within their walls notable firms such as Llyod’s of London amassed princely wealth, along with a taste for the acrid flavor of coffee. It was only a matter of time until a brewer latched onto the trend and developed a beer with similar characteristics. Doubt that? Look at what US microbrewers did in the mid 1990s. They won new customers who grew up on “soda-pop” by producing light fruit-flavored beers. Fortunately, at the same time coffee grew popular, technological advances equipped malt houses with the ability to ‘drum roast’ grains. This was also essential to the development of stout, and it clearly dates the introduction of stout after porter. Whatever story about the development of stout you prefer, one part of its introduction remains unchallenged: the story of Guinness. In 1759 Arthur Guinness closed what his peers considered a foolish real estate deal. He agreed to pay 40£ per year rent on an old idle brewhouse. The unusual or foolish part was the term of contract, a period of 9,000 years. As things turned out Guinness was far from foolish. At first the brewery promised nothing but struggle, but his fortune changed in the 1760s when he moved away from ale. The beer he switched to was stout. Guinness brewed his with high levels of roasted grain to emphasize the coffee character. Next, he intentionally added the unthinkable – sour beer – but in a controlled amount (approximately 1%) he found it pleasantly dried the finish. His modifications brought rising profits and a complete switch to ‘porter-stout’ in 1799. From then on stout was solidly linked to the Guinness family name. Other brewers watched the influence of stout expand and joined the trend. William Beamish and his partner William Crawford sold their first stout in 1792. By 1800 they were the largest stout brewer in Ireland, a position they held until 1833. Another famous label came from the family of James, William, Jerome and Francis Murphy when, in 1856, they gave up on porter and made the switch to Murphy’s Stout. Why did porter decline and stout triumph? It had to do with politics and war. During World War I rationing and energy restrictions in England prevented malting companies from deeply roasting grains. But Ireland, poised on the edge of rebellion and leaning toward alliance with Germany, was treated with kid gloves. No restrictions of any kind were enacted. During the war, and after, England moved away from their dark beer while Ireland continued its love affair with stout. Irish stout brewers began with a style now known as ‘dry stout’ which supplied the foundation upon which all sub categories of stout were built. Roasted barley, along with a small amount of black patent malt, imparts the coffee-like personality nearly everyone associates with the style. But to stop there would unjustly toss stout onto the refuse pile of the uninspired. By no means should it suffer a reputation of singularity. For drinkers willing to delve beyond the obvious, stout unveils a masterful composition of the sublime. It offers the beer enthusiast an enigma wrapped in a pint and further clouded by a refined coarseness. To crack its mystery requires objectivity and a willingness to strip away the myths. In the traditional form of Irish dry stout the color never approaches a depth close to opaque. Holding any of the classics up to a light rewards the drinker with captivating hues of deep garnet. Next, the aroma extends a clean salutation unencumbered by hops. Beneath the persistent aromatics of roast coffee the first vestige of subtlety emerges in a combination of light fruitiness, hints of malt and a trace of caramel, all graceful and understated. As in the aroma, coffee bitterness permeates the flavor and masks dry stout’s true personality – one of contradictions. It starts sweet, yet finishes slightly bitter, builds a hoppy bite, but yields no hop flavor, fades to a smoothness in mid-taste, and then with a small burst of refreshing sour tartness abruptly concludes. Finally, with its soul bared and all secrets exposed it surprises you once again, for dry stout can rightly lay claim to king of the light beers. It packs a lean 12 calories per ounce and a restrained alcohol content measuring less than 4 percent. What could be better? Perhaps one of its four offspring. Foreign stout represents the first member of stout’s extended family. As the name implies, it was brewed to ship beyond Ireland’s shores. Although foreign stout retained the undiminished qualities of the original, it further emphasized elements that naturally preserve beer. To that end brewers fortified it with additional malt. That modification significantly darkened the beer; moreover, it increased the alcohol which helped stabilize it during transportation. To ensure balance they matched the malt with a higher hopping rate, and it too extended the beer’s life. However, raising the amount of malt inevitably led to a fuller body and production of ‘fruity’ esters, which were subdued in dry stout but blossomed in the foreign version. Along with the esters another by-product was introduced: diacetyl, which lent a touch of butterscotch. The changes bulked up the low alcohol of dry stout to a level of 5 to 6 percent and when this happened it infused the beer with a light scent of perfumey sweetness. 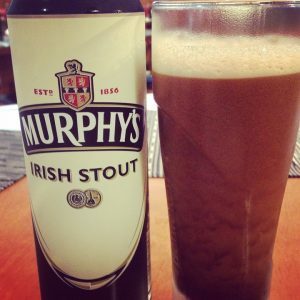 Two other renditions of “full bodied” stouts also evolved from Irish roots. Sweet, or milk stout was England’s answer to their neighbor’s success. Dramatically altering the original, they reduced the roasted barley. In its place they substituted chocolate malt augmented with milk sugar (lactose.) Yeast wouldn’t ferment either of the new ingredients well, and thus sweet stout remained low in alcohol. In a way the modifications created dry’s alter ego. Sweet stout lacks both the attractive luster of deep garnet clarity, and sharp flavors found in a dry stout. Instead, it steps forward with a sensuously dark concentration of full, thick bodied malt. Enveloping the tongue like the impenetrable fog of the North Sea, brewers check its sweet intensity with a calculated balance of dark grains and hops that hold it comfortably short of cloying. Sweet stout’s texture captured drinkers attention and inspired a separate formulation which included oatmeal. Inducing a silky sophistication, oatmeal stout drew immediate approval. Beyond the change in mouth-feel it largely parallels the personality of sweet stout. It offers a full body, an intriguing mix of sugared coffee, chocolate, roast, and nutty flavors. It may also expose a teasing suggestion of caramel and faint butterscotch. Again, it contains little hop flavor or aroma. Inspired by a novel event, “Imperial Stout” was a child of necessity. Peter the Great was the first Czar to travel beyond Russian borders, and his visit to Europe influenced its design. A famous beer drinker, Peter fell in love with the west’s advanced brewing skill. Every beer he tried was proclaimed better than any found at home and after his return the Russian court issued a contract for English stout. That order brought a mixture of joy and trouble. The endorsement was wonderful, but how could it survive the long trip? Brewers applied a proven technique – high alcohol and hopping rates. Boosting the amount of fermentable malt contributed more alcohol. It also lightened the color to an alluring complexion of reddish-brown. Unlike its relatives, imperial stout possesses an assertive nose of bold hops. As it warms evident alcohol emerges, further complemented by notes of fruit and malt. A taste validates everything anticipated in the aroma. The medium-full body delivers an almost candied malt base with a noticeable degree of buttery diacetyl. In some examples fruity esters contribute a plum or prune character. Under its complexity the coffee flavor remains, enhanced with a subtle wisp of cocoa.